Our experienced and dedicated yoga family is excited to share thoughtful classes and workshops with the Bluebird Sky Yoga community. Scroll over each photo to learn about each teacher's background, teaching style, and what brought them to yoga. Recently named one of Yoga Journal International’s Top Yoga Instructors Under 30 to Watch, Jennie Light is the founder and owner of Bluebird Sky Yoga. Jennie started practicing yoga in 2007 while living in Colorado and was immediately hooked on the fluid movements that reminded her of her days dancing growing up. Yoga has remained an integral part of her life because it allows her to disconnect from the stress of daily life, connect with an incredible global community of compassionate people, and see the world more clearly. Across Jennie’s years studying yoga, she has fallen in love with many different lineages, in large part because of the diverse and inspiring teachers who have passed through her life. Through her classes, Jennie seeks to encourage students to grow as her teachers have done for her. As a former radio show host, music is a central component of each of her classes. Jennie completed her 200-hour Vinyasa and Power Yoga training with Mimi Rieger, 50-hour Progressive Ashtanga Vinyasa (Rocket) training with David Kyle, 60-hour Primal Yoga® Flow training with Liz Arch, and countless other workshops with master teachers. Expect thoughtfully sequenced classes influenced by the Ashtanga tradition and infused with playful sequencing, funky variations on traditional poses, pranayama, and on some occasions martial arts (from her Primal Yoga® Flow background). Her classes are taught with the goal of inspiring students to move both freely and intelligently, and to find mental clarity to take with them off the mat. Janet (RYT) took her first Ashtanga class in 2004, while living in Chicago, and has had a regular practice ever since. As a former Ironman triathlete, she was searching for a vigorous style of yoga. However, as her practice became deeper she realized that the benefits of the practice extended well beyond the physical level. Through her daily practice, she has cultivated an inner peace that helps her stay centered amidst the intensity of modern urban life. When Janet was pregnant with her daughter, she completed the 200 hr. training at Moksha Yoga Center, guided by Daren Friesen, as a way to deepen her overall practice. She modified and practiced Intermediate Series with her teachers Kino Macgregor, Todd Boman and Bridgett Piacenti, until the day her daughter was born. She found the practice to be healing, centering, and immensely helpful during her pregnancy and delivery. In 2012, Janet and her family moved to Washington, D.C., where she felt immediately embraced by the growing Ashtanga community. Janet is honored and excited to direct the Mysore program at Bluebird Sky Yoga. She will welcome you to the Mysore room, whatever your level of practice, and guide you through your own personal growth process. This will include learning the Ashtanga sequences, through individualized instruction. To learn more about “Traditional Method,” read this, published by her teacher Day Christensen. Off the mat, Janet is an Assistant Professor in the Department of Education at the University of Maryland, and the mother of a 6-year- old budding yogi. Danielle (200 RYT) took her first yoga class as a Freshman in high school, and, while she was a fairly inconsistent little yogini at first, a seed was planted. She picked up the practice years later to find peace amid the stress of corporate life and the beautiful madness of living in New York City. When the universe gave her signs that the time was right, she replaced her business attire for yoga pants, and completed her 200-hour training through Yandara Yoga Institute in Todos Santos, Mexico. There, she also received her level 1 Reiki attunement with Allison Eaton, completed her Rasa Restorative Training with Jamie Lyn Skolnick through Laughing Lotus in NYC in 2015, and continues her role as student on and off the mat 24/7. Danielle’s practice is rooted in Ashtanga, and her classes marry the structure and consistency of this lineage with creative sequencing and her restorative nature. Expect strong emphasis on alignment and breath, the permission to not take anything seriously, and to be part of her own exploration of the the world around her through the lens of yoga. Elena, native of Moscow, Russia, discovered yoga in Washington over twenty years ago. After completing her graduate studies at George Washington University and working for a few start-ups, Elena fully dedicated her life to her three kids, taking dog Sampson on fun runs in Rock Creek Park and hosting dinners for friends and family. Her passion to explore the outdoors on foot, wheels, or skis extended towards the yoga practice as well, leading her to complete a 200-hour RYT training program at The Studio DC in 2015. Elena offers group yoga classes as well as the private yoga classes and the outdoor adventures through ‘NYogaFitness. Elena’s classes encourage students to explore, in a fun and playful way, a courageous and kind warrior inside their hearts, culminating the practice by feeling strong and grounded, balanced and inspired, loving and compassionate. Mimi has been practicing yoga since 1998 and has been teaching for over fifteen years. Her physical journey began with ballet at the age of four through her teens and progressed to martial arts and yoga in her twenties to the present day. Mimi is passionate about her wellness exploration and her teaching encourages others to seek their most powerful and evolved selves. Through the practice of yoga and the evolution of the mind/body connection, students will find a greater sense of self and confidence on the mat by taking their physical practice to the next level. Mimi is registered through Yoga Alliance and received her yoga certification in 2003 at the Ashtanga Yoga Center in Washington, DC. In 2005, she became the first certified Budokon® teacher in the area and is the Regional Director of Budokon® Yoga for Budokon® International. In 2009, she received her Progressive Ashtanga Yoga certification and in 2010 received her Rocket Vinyasa Yoga certification both under David Kyle. Mimi teaches with a strong yet practical manner encouraging students to push forward, explore and progress past existing practices and barriers in their physical paths. Mimi teaches a variety of classes; all are based on powerful, dynamic movement with creativity and compassion at the helm. Students can expect a full body practice incorporating Sun Salutations, a strong standing series, balances, twists, core work, a seated series and inversions. Full body connectivity is paramount in Mimi’s teaching as she invites students to find balance and build strength as they flow through thoughtful, graceful transitions. Classes are based on the Ashtanga Yoga series with a strong alignment foundation and offer students more advanced variations and postures as they progress through their practice. All students are welcome and each practioner will work at their own level. Mariah grew up in Takoma Park, MD, right outside the city. She started practicing yoga as a teenager, and has continued to deepen her practice as way to gain physical strength, reduce stress, and gain a deeper understanding of the innate wisdom and light that lies within everyone. Mariah sees yoga as a great tool to create a ripple effect of health and positivity throughout your life. Mariah’s classes feature lots of core work to build a strong foundation for all poses, and plenty of deep, delicious stretches to keep the body feeling fluid and free. Expect creative sequencing and fun music to keep things fresh. Find out more and connect at mariahmcpherson.com. Whitney has been a student and teacher of yoga for the last 10 years. She has studied many different styles and with many teachers. However, the traditions that have called to her most have been Ashtanga and Iyengar. Whitney is drawn to the extensive lineages that both of these traditions maintain, and also their emphasis on the teacher-student relationship. It has been Whitney's experience that having a one-on-one relationship to a teacher is essential for progress in yoga. This is what led her to focus her energy and efforts to working with one-on-one with students. Whitney finds that students are able to work on a deeper level and make greater strides in the context of private sessions. Whitney is honored to assist and bear witness to each student's hard work and transformation though yoga. Whitney has taken 2 extended trips to India in the past few years to further her studies; one to study at KPJAYI with Sharath Jois (Mysore, India), and one to study her other passion, Ayurveda, with Dr. Vasant Lad (Pune, India). She plans to return to India yearly to continue her studies in both subjects. Originally from Haiti, Kethia grew up in Boca Raton, FL and ventured to D.C. in 1996 to attend Georgetown University. She developed an appreciation for mind-body-centered fitness in 2002 when she became an Ashtanga yoga practitioner at age 23, practicing five days a week. Though she had been weight training, dancing, and engaging in different sports, she was woefully out of shape a year after she ran her first marathon. She seized an opportunity to accompany her co-worker to an Ashtanga yoga class and loved it! Kethia soon became a regular Ashtangi and added Pilates to her regular fitness regimen in 2004, thus becoming an instructor of both disciplines in 2006. Kethia's yoga sessions are so transformative that she's still amazed at her emotional and spiritual journey. On my mat, she feels she's on a daily retreat and the rest of the world ceases to exist. Kethia had been walking through depression since childhood and the discipline of Ashtanga greatly empowered me. Her anxieties and darkness began to melt away through the mat. Kethia says, "Ashtanga and I formed the perfect union." Her passions include teaching kids yoga and training athletes. She's ambitious and focused on success, yet prioritizes the time needed to rejuvenate herself. Yoga provides a holistic approach to training mind, body, and spirit, furthering her evolution towards the healthiest version of herself. Lawrence seeks to serve his students with an empowering flow that awakens an inner calm. He resourcefully and strategically sequences breath and movement to create a dynamic flow that opens their hears and unlocks their true nature. Hari-kirtana das is registered as an E-RYT 500 yoga teacher with Yoga Alliance, holds an 800-Hour teaching certification from the Jivamukti Yoga School, and is the author of the book In Search of the Highest Truth: Adventures in Yoga Philosophy. Having a life-long interest in yoga, meditation, and eastern spiritual philosophy, Hari-kirtana lived full-time in devotional yoga ashrams and intentional spiritual communities from 1977 to 1981 and was formally initiated into the Gaudiya Vaisnava lineage of Bhakti Yoga in 1978. After years of study and practice and with the encouragement of his teachers, he began teaching contemporary yoga classes in 2009. He currently teaches classes, leads workshops, designs Yoga Teacher Training courses, and is a frequent guest-teacher for numerous regional Yoga Teacher Training programs. He also leads annual spiritual pilgrimages to India. You can learn more about Hari-kirtana by visiting his website: hari-kirtana.com. Becky is a music-loving, profanity-speaking, southern lady with very little drawl but a lot of hospitality. Her love for yoga has changed the way she approaches herself, her loved ones and the world she lives in, and she thinks it's for the better. Her classes are heavily influenced by her personal practice of Ashtanga yoga, where the asana is athletic and the movement is methodical and mindful. Becky's classes are taught from the heart, honoring the teachings that have and are still being passed down to her by her teachers, but she likes to keep it light, too. Learning to observe our own patterns and responses is immensely deep work, so being able to do it with a sense of levity makes the process feel more balanced. Equal parts grace and grit, warm and wry; sthira and suhka (effort and ease). Emily (RYT, RPYT) is committed to teaching dynamic, strong, yet lighthearted yoga classes to students of all levels. She has practiced yoga for over twelve years, and taught yoga for over six years. She received her 200 hour yoga teacher certification in 2010, and her 85 hour prenatal yoga teacher certification in 2016 (while pregnant with her first child!). Emily sees the value in practicing many different types of yoga and enjoys helping students see that some days you may benefit from a power vinyasa class and other days a restorative class is what the body needs. Chris is a passionate practitioner and teacher who began his yoga journey 5 years ago. Enticed by the strength and endurance of the practice, he committed to a daily ashtanga discipline and began teaching as a group fitness instructor at Coastal Carolina University’s’ HTC recreation center. A local of the DC and Maryland area, he completed his 200 hour Power Vinyasa training with Mimi Rieger, an expert and master teacher in the DC, MD and VA communities. His approach to teaching draws from the ashtanga method and fuses it with modern vinyasa techniques to help students challenge and empower themselves both on and off the mat. You can expect an invigorating and fun flow infused with an eclectic mix of martial art, tai chi and rocket-vinyasa style movements that will leave you feeling like a warrior inside and out!" After swimming competitively for most of her life, Colleen found herself in a yoga class while looking for a form of exercise that was challenging, cathartic, and didn't require shoes. She immediately felt the magic that occurs when you unite the body and breath, and fell in love. Colleen completed her 200 hour teacher training under Angela Meyer and Jess Pierno and continues to study and immerse herself in the wide world of yoga, most recently by enrolling in the DC Budokon Academy. With intuitive sequences, loving assists, and a playlist for every occasion, she creates a lighthearted environment for her students to explore both physically and emotionally. Colleen's classes are grounding and playful - expect to sweat and smile as you find your edge in a thoughtful, compassionate way. Kate began a regular yoga practice over 12 years ago, after she happened upon an Ashtanga primary series class in Minneapolis. 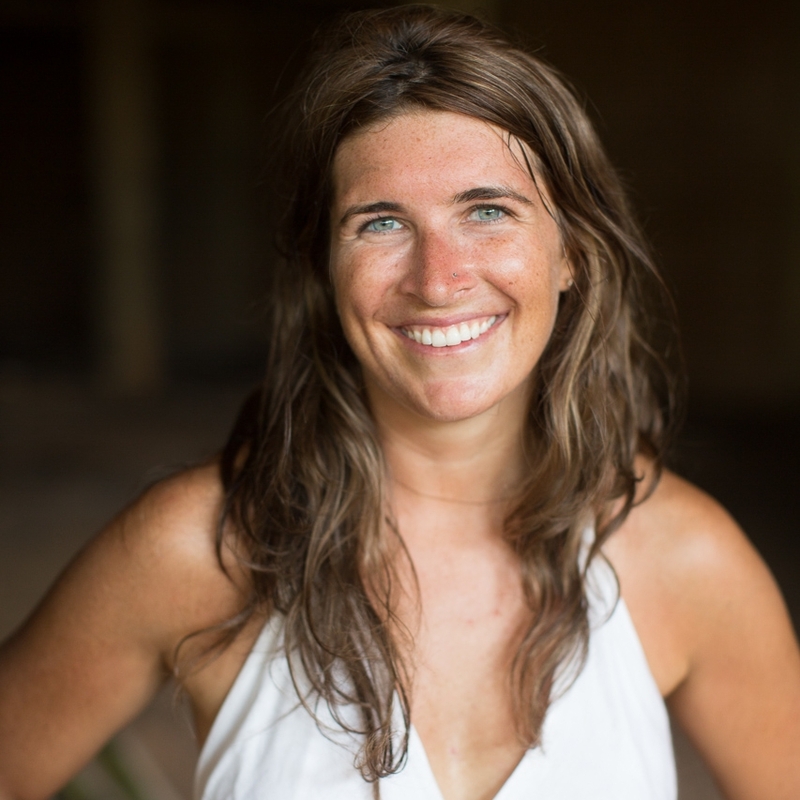 After graduating college, Kate moved to North Carolina where she completed her 200 and 500 hour teacher trainings as well as the Ashtanga Primary Series teacher intensive with David Swensen. After several years of teaching, she became the first full-time yoga teacher for Womack Army Medical Center's Intrepid Spirit Center on Ft. Bragg, NC for two years, teaching yoga and mindfulness practices to active duty soldiers as a part of the Pain Management and Traumatic Brain Injury Clinics. Kate's classes are influenced by several different styles and lineages with a focus on the dynamic sequencing of Ashtanga yoga blended with an emphasis on safe alignment and healthy movement. As a teacher, her intention is to offer classes that are designed to inspire self-awareness, a feeling of personal empowerment as well as a sense of the connection we have to ourselves and the world we live in. I grew up moving often (not in the physical exercise kind of way) so I never really connected with sports teams or anything that brought consistency, other than books and school. It wasn't until I was 23 that I took up any sort of physical activity- which turned into a multi-year love affair with distance running and all things cardio- the typical DC exercise habits. Young, anxious, and stressed out, friends would often tell me, "You really need to do some yoga." I tried a handful of discount/free classes over the years, but I could never get past the idea that yoga had to be slow and I'd be sitting with my thoughts. Then something changed- I was drawn to the practice and immediately hooked, and haven't looked back since. A few months into my practice, I discovered Rocket Yoga, and I felt like I had truly found MY practice. It's strengthening, meditative, fun, and it has made me connect with and appreciate my body in ways other activities have not. I've studied the Rocket sequence under Jonathan Ewing, and practiced with master teachers Steve Pyka and David C. Kyle. I have a deep appreciation for the structure of the sequence, the encouragement of play with transitions and funky variations, and most of all, I love the meditative aspect of Rocket Yoga- knowing what's coming next, and the ability to follow your own breath through each asana. Drawing from the rocket community of fellow teachers and students that have inspired me to see my own strength, I bring an optimistic enthusiasm to my classes, encouraging students to believe in their limitless potential. Sarah is a movement specialist. She has trained in a variety of movement disciplines and believes that her dedication to complementary training is what continues to elevate her physical and mental conditioning. Her comparative advantage as a teacher and coach lies in her ability to utilize deliberate programming toward the most necessary and functional strength and mobility endeavors, in every format she teaches. With an emphasis on progressions, biomechanics, and skill development, Sarah's tested training methodology is so much more than a workout. She currently trains private clients and teaches public classes and workshops in yoga asana, aerial yoga (in a silk hammock), acro yoga (with a partner), Pilates mat and apparatus, bodyweight calisthenics (stall bar and gymnastic rings foundational training), pole fitness, kettlebells and body rolling (self-myofascial release). Sarah’s extensive training, inordinate amount of energy, self-practice, and dedication to continued learning is only rivaled by her genuine love for sharing movement with her students and helping them to move with power, grace and joy. Andrea first found yoga as a way to cross train at the gym. When marathons left her limping due to an old injury, she came to the mat for rehab. It was through the practice that she found a place of empowerment and strength, both on and off the mat. Trained in Power Vinyasa Yoga with Mimi Rieger, Rocket Yoga with David Kyle, and Pilates Mat 1, Andrea's sequences are Ashtanga inspired with a focus on strength, alignment, and personal creativity. There is an athletic element to her classes with an understanding that one size does not fit all. Students can expect a full body practice including Sun Salutations, standing/seated postures, balances, twists, and inversions. Options are always given. Andrea's laid back and positive personality make her classes upbeat, educational, and challenging. Her goal is to create a supportive, judgment free space where students can experiment with new shapes, fall, laugh, and learn. Students are reminded to let the breath guide the practice while discovering and respecting their personal edge. She keeps her classes around 75 degrees and music ranges from indie rock to deep house. No incense will be burned. J completed their 200-Hour Power Yoga training with Mimi Rieger in 2018. Ingrid started practicing yoga in 2003 while finishing college in Boston and getting ready to move to Namibia as a Peace Corps volunteer. Her practice varied as she moved around over the years, but in 2011, Ingrid taught her first classes to development workers, international entrepreneurs, and local South Sudanese in Juba, South Sudan. Those classes were a wonderful reminder of what yoga provides both on and off the mat. Participants enjoyed the physical activity and meditative moments in class, and leveraged those benefits to handle the stress of living in an unpredictable environment. Ingrid thinks deeply about how crucial yoga's "off the mat" benefits are in finding physical, mental and emotional balance in our hectic lives and what she carries off the mat, and into her daily life, has shown her the role yoga can play in the journey to be a stronger, more balanced and healthier person. She received her RYT-200 certificate in 2013 and has been teaching off and on since returning to Washington, DC. Ingrid enjoys meeting students where they are and adapting classes to fit the group in that particular moment. She encourages the use props, provides modifications and hands-on assists to ensure every body finds stability before safely exploring poses. Jessica's purpose in teaching yoga is to encourage the integration of body, brain and spirit, and to embrace the highest quality of life that each of us can create for ourselves. She infuses her yoga teaching with her experience as a neuroscientist, a musician, and a mother. From her classes you can expect a focus on physical strengthening and breath-guided flow of movement. Woven throughout are thought-provoking guided reflections on how we experience life through our minds and bodies and where we can find those points of meaningful challenge, fulfillment and contentment. Jessica completed her 200-hour yoga teaching training in 2014 with YogaWorks. Daisy's teaching is rooted in the Ashtanga tradition. She provides a loving, inclusive space for students of all levels to explore the practice of asana (physical postures), pranayama (breath work), philosophy, and meditation. Expect individualized instruction and a powerful flow focused on balancing the physical, emotional, and energetic bodies. Daisy graduated from Mimi Reiger's 200-Hour Power Vinyasa training in February 2018. She has completed a Reiki I training at the George Washington Center for Integrative Medicine. Kristine's yoga journey started in Korea, where she practiced Iyengar with a wonderful yogi who taught her how to combine breath and movement in asanas. After moving back to the US, she took various yoga classes, but never found a yoga community or teacher that appealed to her until Bluebird Sky Yoga (BSY) opened practically next door. She immediately fell in love with the Mysore Program, it's Director, Janet Walkoe, and the community of practicing yogis. Building on her strong and consistent asana practice and further study of the other limbs of Ashtanga, Kristine is currently serving in BSY's Mysore Apprenticeship program. When Kristine first began to practice Ashtanga, she enjoyed developing her strength and endurance, and also learning something new. Two years later, she loves the overwhelming feeling of vitality that has come from a daily practice, providing evidence that 40 might be the new 30 after all. More importantly, Kristine appreciates how the lessons from her mat transform her life as a mom, city dweller, activist, and community member, helping her understand when to let go and that changing one's own reaction is central to supporting positive outcomes. Kristine is ready to assist anyone who is interested in the Mysore practice and hopes that they find similar insights in their own lives. When she is not in the Mysore room you can find her cooking at home, spending time with family and friends, or making wheel-thrown pottery. Syamala Priya devi dasi (Sara Sheikh) began her yoga and meditation journey in the mid-1990’s with traditional hatha yoga and Thich Nhat Hanh’s trainings in Mindfulness Meditation. After years of adopting yoga as a way of life she was inspired to share the transformational practice with others. In 2008 Syamala became certified at the 200-hour level with the International Sivananda Yoga Vedanta Center. In years since she has expanded her personal practice by studying the Jivamukti and Yin yoga methods and gaining a deeper understanding of yoga philosophy through mentoring and trainings with Hari-Kirtana das. In 2017 she received spiritual initiation from Radhanath Swami in the Krishna Bhakti tradition which emphasizes the linking of one's spiritual identity, thoughts and actions with the Absolute Truth through devotional service to a personal form of the Divine. Offering classes for beginning as well intermediate students, Syamala integrates mantra meditation, philosophy, vinyasa or yin sequencing, regulated breathing and deep relaxation into each session. In class she is known for her down to earth, clear and in-depth instruction. Responsive and sensitive to each individual, she is committed to helping students achieve a healthier-balanced lifestyle. As a social worker, Syamala has had the privilege to teach yoga to children and families in underserved neighborhoods through a wide variety of community organizations. Atticus is a mindful movement facilitator who sources inspiration and expertise from myriad sciences. Her study of the human body as a tool for awakening and empowerment is rooted in yogic studies (500-hour RYT), classical and contemporary dance, Contact Improvisation, Dance Movement Therapy (DMT), Authentic Relating Games, Insight Meditation, Mayan cosmology and many more. She has taught for The Kennedy Center, The Hirshhorn Museum of Modern Art, multiple 200-hour teacher training programs and facilitates international retreats. amazed at how yoga opened her mind and spirit as much as it did her body. It was love at first asana. safe alignment that will provide a sustaining practice. variations, and offers a playful atmosphere for challenging poses and arm-balances. people and explore different cultures. Alexis is is a lover of movement and adventure: running, yoga, hiking and traveling. She’s an Ashtanga practitioner who fell in love with the creative freedom and less strict “rules” of the rocket practice and encourages her students to invite that same playfulness in their own daily yoga practice. Jennryn has been practicing yoga since 2001 and loves bringing the different elements of yoga to her daily life and travels. From practicing poses in mud huts, as a Peace Corps volunteer in Niger, to stretching along the beach at a community development program in Thailand yoga has served her as a home away from home. With 200-hour RYT certification in 2012, and Prenatal Yoga certification in 2016, Jennryn feels blessed by the chance to share the practice with others. Outside of teaching prenatal, Baby & Me and the occasional vinyasa class, Jennryn loves working at Creative Commons, and serving women as a birth doula. Lexie began yoga as a way to compliment her Shuri-Ryu karate practice more than ten years ago. She found the physical and mental benefits of yoga translated in profound ways off the mat as well as in the dojo. In her classes expect a sweaty and strong flow with an emphasis on breathing and energy work. As a teacher, she encourages students to stay curious and to cultivate an individual practice. Lexie was born and raised in Tallahassee, Florida. She has been living in D.C. since 2009. Elyse found her love for yoga after walking into a Rocket class post college. Movement was always a part of her life coming from a dance and athletic background. Growing up in a household with both parents Chiropractors she values a healthy body and mind for happiness in life. Originally from the Jersey Shore she spent her days playing at the beach. Her playfulness comes out in her classes where she encourages everyone to invert themselves once a day. Over years of consistent practice she believes yoga can strengthen your body and soul. Her class gives you the opportunity to develop a solid Rocket yoga practice and challenge yourself. Elyse is a dedicated Rocket student and completed her 200 hrs with Jonathan Ewing at Flow Yoga Center in D.C. You can also find her in the early morning in the Mysore room practicing Ashtanga under Michael Joel Hall. Her Rocket classes include Ashtanga inspired hands on assists and make you wanna dance playlists. Magnolia Zuniga, and Sharath Jois. and hike with her dog, an Indian rescue.